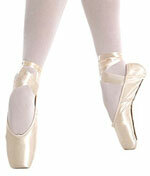 Aurora hand made pointe shoes have a streamlined box and flexible side wings for comfort. The back rises higher at the heel ensuring that the shoe does not slip off. Amber hand made pointe shoes have a streamlined box and flexible side wings for comfort. The back rises higher at the heel ensuring that the shoe does not slip off. The pouch is open weave to release moisture and to protect your satin pointe shoes.